Volatiles in the Martian Crust is a vital reference for future missions - including ESA’s EXO Mars and NASA’s Mars2020 rover - looking for evidence of life on Mars and the potential for habitability and human exploration of the Martian crust. Mars science is a rapidly evolving topic with new data returned from the planet on a daily basis. The book presents chapters written by well-established experts who currently focus on the topic, providing the reader with a fresh, up-to-date and accurate view. Organized into two main sections, the first half of the book focuses on the Martian meteorites and specific volatile elements. 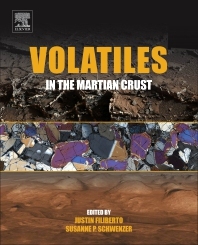 The second half of the book explores processes and locations on the crust, including what we have learned about volatile mobility in the Martian crust. Coverage includes data from orbiter and in situ rovers and landers, geochemical and geophysical modeling, and combined data from the SNC meteorites. Justin Filiberto has focused on volatiles (F, Cl, H2O) in the Martian meteorites and what this can tell us about the Martian volatile budget. He is an associate editor for Journal of Geophysical Research – planets.